As the days start to get a little bit shorter and the nights start to have a little bit more chill to them, I find myself reaching for the things I will miss most once the seasons change. August days are some of my favorite but each passing day is a bittersweet reminder that our summer days will soon run out long before we are ready. And with that, I find myself soaking up all the summer things - food, activities, and of course, that summer attire. The easy, breezy, carefree look that can only be found between the months of June and August is one of my favorites. It is and always will be my season of preference, especially when it comes to creating the perfect summertime look. With only a few weeks left, I wanted to share some pieces that have caught my eye lately and are still so unapologetically summer. I hope they inspire you to soak in a little bit more sunshine, spend days in your bathing suit and your bathing suit only, and eat one too many ice cream cones. 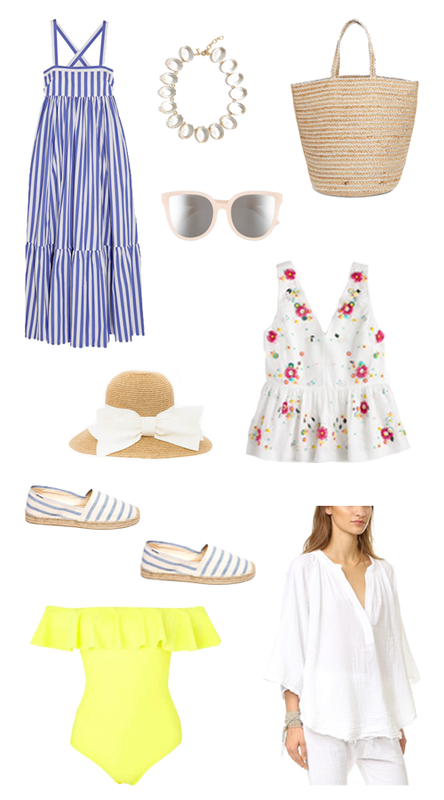 I promise you that if you happen to stumble into me in the next few weeks, I will without a doubt be caught in this carefree, resort-inspired attire. I hope you will join me! Weekend Getaway in Portland, ME.